With all the viruses out there these days, many mail servers simply block all attachments, or only allow a small set through. One set of attachment extensions that you don't want to block however are the extensions defined in RFC 2311 § 3.2.1 for S/MIME. After 163 votes, I've decided it's time to retire my poll: "What Database server do you use? 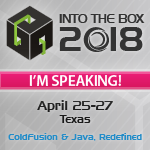 Robi Sen a while back posted a blog entry with some useful tips on solving java.lang.OutOfMemory exceptions, and tuning the JVM for ColdFusion MX. He has recently posted a follow up to that entry. If your looking for a JDBC driver for SQL Server that will work on multiple platforms, and is free - take a look at jTDS. The jTDS project also claims that it is the fastest JDBC driver for SQL Server, based on these benchmarks. Amazon is now offering a Simple Queue Service. Many people think that converting a given string to upper case and converting to lower case will perform the same. While they probably do use a very similar algorithm, the fact the most text is lower case makes converting to lower cause a more efficient option for most strings.